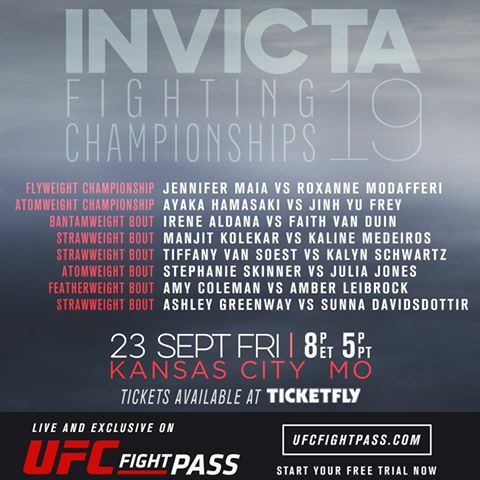 At 31-years of age, rising Invicta Fighting Championships star Jinh Yu Frey (5-1) will fight for the organization’s 105-pound atomweight title next Friday, September 23. She is challenging current champion, Japan’s Ayaka Hamasaki (13-1) who is three years her elder. We caught up with the Texas native to discuss the upcoming title bout and her fight career. MyMMANews – You are fighting for the Invicta FC atomweight championship on September 23 against champion, Ayaka Hamasaki. You are on an incredible three fight win streak, however, Hamasaki’s only loss comes at the hands of the most recent UFC strawweight title contender, Claudia Gadelha. On paper it would appear that Hamasaki has more experience. How do you mentally prepare for the biggest fight of your career to date? MyMMANews – What do you need to do on September 23 to ensure your hand is raised and the belt wrapped around your waist? MyMMANews – You are an incredibly talented individual both inside the cage but outside the cage as well. You have an MBA and work with cancer patients. What has been the most rewarding aspect of being in that line of work? MyMMANews – The goal of most every fighter is to one day make it to the UFC. Currently the lightest weight in the female division is strawweight. Do you feel that if the UFC does not take on any other weight classes that you could pack on the weight and contend at 115 pounds? MyMMANews – Lastly, if you could give any bit of advice to a female athlete just getting started in the sport of mixed martial arts today, what would you tell her?